If asked to give a name to this geographical region, which includes parts of Europe and Africa as well as Asia, you'd probably say "The Middle East". Our "Middle East" should lie between the "Near East" (not much used today - it once meant Greece and Turkey) and the "Far East" (China and Japan), because western Europeans have always seen themselves as the centre of things. But Europe was way off in the "Far West" when civilised life was starting to evolve in this region. "And out of the ground made the Lord God to grow every tree that is pleasant to the sight and good for food"
They’d had a very long earlier period of dominance, and a more recent second go. They had controlled most of the territory marked on the map above as Lydia, Median Empire and Babylonia. They had been very aggressive, utterly ruthless, and extremely successful - terrorising the peoples between the Mediterranean coast and the Zagros mountains. 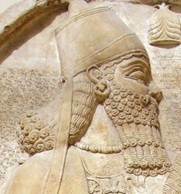 With leaders like Sennacherib they seemed unstoppable - cities were wiped off the map. But when they started fighting among themselves, their empire began to break up. 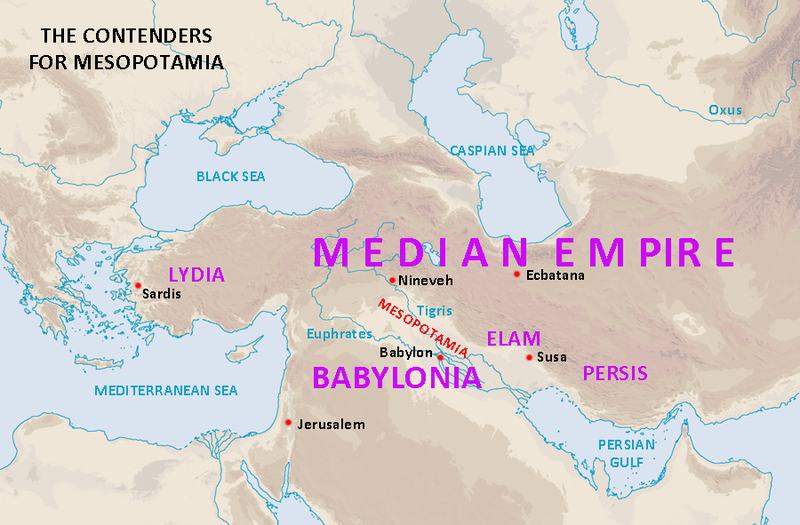 The Medes, Babylonians and Lydians took over their territory, and destroyed their capital at Nineveh in 612 BC. But their art, architecture, language (and script) as well as their skills in fighting and organisation had a deep influence on the Persians, when they became the super-power. More on the Assyrians. As the Elamites occupied much of the territory later ruled by the Persians, there's a full section about them here. Their centre was in Khuzistan, to the west of the Zagros mountains, and their capital was at Susa. They had competed with the Assyrians and Babylonians for control of Mesopotamia - but finally lost out to the Assyrians in 616 BC - until they in turn fell to the Medes. From around 650 BC, part of their territory, Anshan in the southern Zagros mountains, had been taken by the expanding Persians. More on the Elamites. They had also had had earlier success, always in rivalry with the Assyrians. The founder of the first and rather brief Babylonian empire, Hammurabi (died c.1750 BC), produced one of the world's earliest codes of laws. 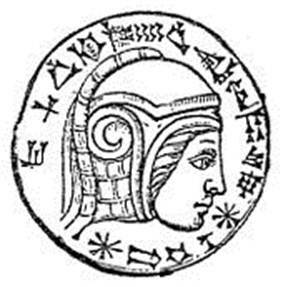 Dominated for a long time by the Assyrians, who had destroyed their capital at Babylon, they finally shook them off, and, under Nebuchadnezzar II, rebuilt their city. Its size and beauty made it the most famous in the world. Under Nebuchadnezzar, the Babylonians destroyed the Temple in Jerusalem, and took the people of Judaea as prisoners to Babylon. Then the Medes appeared … More on the Babylonians. 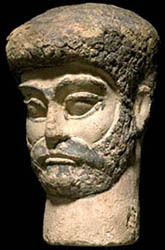 The Medes were very closely related to the Persians. Allied with the Babylonians, they finished off the Assyrians. Herodotus tells us that, from their capital at Ecbatana (Hamadan), they ruled an empire which bordered Lydia in the west and stretched as far east as Afghanistan, and included Persis. However, the extent and even the existence of a unified Median empire is now disputed by scholars. But, in any case, the Medes' rule was brief. 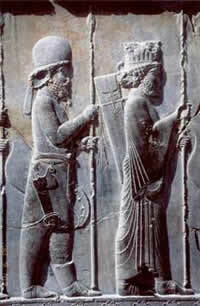 Their conqueror, according to Herodotus, was to be the son of a Mede princess - and a Persian father (unless he was an Elamite) … The Medes and Persians were henceforth united under a single ruler. Mesopotamia, land of two rivers - the prize which all aspiring empires in the "Middle East" had to compete for. Once the mighty Assyrian empire had fallen, the contenders lined up. The Babylonians were in current pole position. The Elamites had been eliminated. The Lydians were a long way away. But there were still the Medes. No one expected the Persians to be contenders. included the Sumerians,the Akkadians, the Elamites and numerous others. See here for a complete list.